#ThatBusinessShow wraps up week 26 today and wishes all a great weekend. Remember to find the show on weekdays at 8am on 1250WHNZ and all shows available On Demand all over the web including http://www.tampabayradio.com and on my YouTube channel at https://www.youtube.com/user/jamiemeloni and email Jamie@tampabayradio.com for sponsorship and guest opportunities! 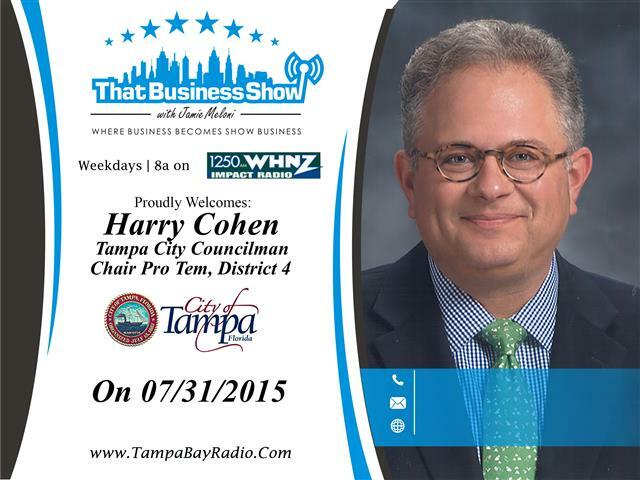 Today I welcomed City of Tampa Councilman, Harry Cohen to the show. Harry is Chair Pro Tem, District 4 and a member of a number of Committees including Chairing the Council’s Finance Committee and is Vice Chair of the Public Safety & City Council Transportation Committees to name a few. Prior to his role in public service, Harry was the Chief Deputy Clerk of the Circuit Court for Hillsborough County and is now in his 2nd term as City of Tampa Councilman. In the opening segment, Harry talks about the storm water drainage issues that plague the City, most notably in the South Tampa neighborhoods. He explains the solution to the problem which involves the use of large culverts that will store the water under the streets and allow the water to drain off in a timely manner beneath the streets rather than on them. The Council will be proposing a storm water assessment increase in the coming month to cover the costs of the solution and Harry also explains how the issue not only affects South Tampa, but the entire City. City of Tampa residents currently have an assessment for this on their tax bills that equals roughly $3/month and the proposed increase is projected now to be around $15/month to cover the full costs of the solution. The referendum is not passed yet and input from City residents is encouraged so please get involved in your community if you have concerns or other input to offer. Look out for Harry on future shows of #ThatBusinessShow as he will be in from time to time talking about the City and all the exciting growth going on in the area! On the 2nd half of the show, Expert Contributor and long time supporter of the show, Ryan Westfall, joined the show. 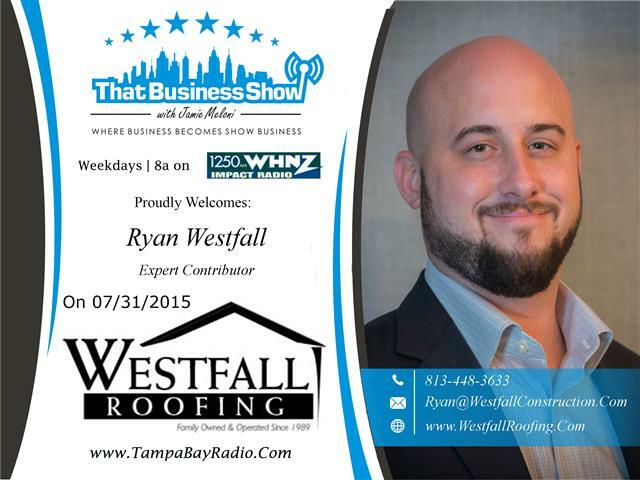 Ryan is the Owner of Westfall Roofing, a family owned business based in Tampa and they have been in business for over 20 years with Ryan taking a leadership role in 2008 after graduating from Eckerd College. The company was a recipient of the 2014 Angie’s List Super Service Award and GAF’s Triple Excellence Award and Ryan was recently featured as an up and coming roofing contractor in the nationally publiched Roofing Contractor Magazine. Ryan shares some of the ways he has helped grow the company through technology where other vendors have neglected technology advancements. Through the use of cloud-based computing, Westfall Roofing is able to give their customers instant quotes/bids, photos and warranty information in a quick, easy to access location instead of the piles of papers that many vendors dump on their customers. The company today has a full staff and many crews with 50 people on staff and is ready for your roofing job today! Reach out to Ryan and Westfall Roofing at 813-448-3633 or email at ryan@westfallconstruction.com and learn more at http://www.westfallroofing.com! This entry was posted in Entrepreneurship and Business and tagged #AmericanPlumber, business, city government, city of tampa, coldwell banker, cuba embargo, harry cohen, roofing, south tampa flooding, westfall roofing. Bookmark the permalink. ← Show Recap – Self Driving Cars & Much More with Tim Schock and Charlie the Plumber!